Welcome to The Fourth Wall, CHIRP's weekly e-conversation on cinema. This week's subject is the Netlix series Altered Carbon. Logan... pardon me, Kovacs...is revived hundreds of years after his “death” to solve a rich man’s murder, because rich people can pretty much do whatever they want to whomever they want. Along with a motley collection of allies/cyperpunk sidekicks, Deckard... sorry, Kovacs...has to figure out who killed the rich man who’s not really dead (because science) in order to win the freedom to wander around moping about all the violence stuff he’s done in his many pasts. The series is gorgeously shot. It’s very pretty to look at. It also doesn’t appear to have an original thought in its head, from the basic premise to the characters to the plot. The good folks who made this series are the same as the people watching it in that pretty much all of them have seen The Matrix, Blade Runner, Elysium, Inception, The Fifth Element, The Terminator, the Star Wars movies, the X-Men movies, etc. Altered Carbon feels like a Frankenstein’s monster made up of bits and pieces of all those other productions. What really annoys me is the character of Solo... SORRY, KOVACS… and how utterly derivative he is. The killing machine who doesn’t want to kill, the loner who longs for connection, the smart-aleck cool customer who’s the only one who can save the world, or at least solve the case. This show made me think about Game of Thrones and what made it unique in how it deals with death. In that series, characters die and stay dead, even the important ones. In many sci-fantasy stories, including Altered Carbon, the human soul or consciousness is just another piece of code to be downloaded, transferred, and stored. While this lowers the storytelling stakes, it’s also essential to serials where the main character has to live on to fight another day. I’m not sure exactly how this relates. 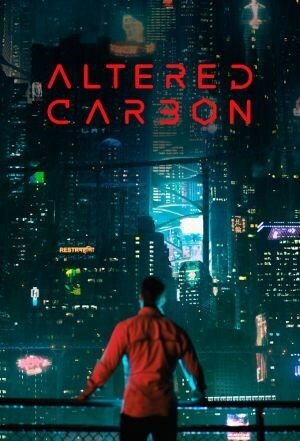 But as far as Altered Carbon goes, I’m having trouble appreciating it either as profound fever-dream techno-noir or as high-gloss trash fantasy. How about you? Wait a second -- did you just say that in Game of Thrones, "characters die and stay dead, even the important ones."? "You know nothing, Clarence Ewing." 1) You can add Battlestar Galactica to your FrankenList of sci-fi influences on Altered Carbon. It's the first thing I thought of as far as downloaded consciousnesses, and conveniently enough, we mentioned this series during the last Fourth Wall post on Black Mirror. Practically everyone steals from someone else on some level, regardless of whether we're talking about cinema, science, or any other field. "We stand upon on the shoulders of giants," so the saying goes. When does an homage turn into derivative? 4) It's commonly said that most shows about the future are in fact reflections of the present, but would we really expect intrepid detective Kristin Ortega (keeping tabs on our anti-hero Kovacs) to have a mom who, in the year 2384, acts like she stepped out of a Mexican soap opera? Her "Neo-Catholic" views as far opposition to the "re-sleeving" resurrection process were an interesting twist, but she seemed just as concerned with whether her daughter was getting enough in the way of home-cooked meals. 5) Much of the show revolves around wealth -- what do you think of sci-fi's take on economic questions? We saw it as a big part of Elysium (where, as in AC, rich folks become even more segregated from us peons over time), yet in Star Trek, money doesn't seem to exist? You're right, I stand 100% corrected. 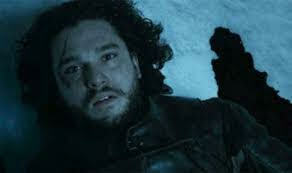 That was a major jump-the-shark moment for GoT, too, at least for me (and, I'm assuming, others). I'm interested to see which way the quality meter points for the final season. For me, movies like The Rules of the Game (1939) and La Dolce Vita (1960) approach the subject of the idle rich in much more interesting ways than AC. Maybe it's because both of those films were made in Europe, where social structures are a lot older. But those films understood how much the elites need their not-rich counterparts for their daily lives, and not just for body parts or cannon fodder. The Ayn Randian notion that what the top of society wants to do most is get as far away from those moochin' poors as possible seems a particularly American (which is to say, Capitalist) plot point. For a big, expensive production (each episode cost $6-$7 million to make) the creators of AC try to cram in way too much backstory, while assuming the audience is just going to pick things up on the fly like in the Star Wars saga. You asked when does homage turn into derivative. As of now, Altered Carbon are my exhibits A-J. You're right, everyone borrows and steals from somewhere else, but they also give something back. Thanks to its horrendous writing and direction, AC doesn't. The one character I kind of liked was Edgar Poe, the AI construct who ran the hotel, only because the actor Chris Conner somehow was able to wring more humanity out of his performance than anyone else. I have no friggin' clue why Poe and Kovacs has the relationship they did outside of the screenwriter having "buddy cliches" and "Deus ex machina" on speed dial. I agree with you about AI constructs interacting by assuming human forms and... playing cards? Makes no sense. I've got one for you, too. If you knew that your your soul, your essence, your very existence was contained in a small metal trinket stapled to the back of your head, wouldn't you go to great lengths to protect that object 24/7/365 with bullet-proof scarfs, reinforced shirt collars, something...?!? Because I'd like to think I would. What did you think of the level of violence in this series? For me, it reminded me a lot of Sin City (2005), another project with a lot of striking visual ideas that supported a plot with an amoral to nihilistic worldview. I like to think I'm not a prude about these things, but there was more than a bit of unnecessary visual carnage there, especially toward women. It's all an interesting comparison to Star Trek, a relentlessly optimistic vision of the future. Maybe it goes to show how movies can tell you as much about the people who make them as the people watching them? With regards to Star Trek, I think films are probably more a reflection of the time period in which they're made. You couldn't get an Andy Griffith show greenlighted in this day and age -- the public is far too cynical about the world for that. The closest would be some sort of parody, a la Pleasantville or The Truman Show. I don't profess to be any sort of Trekkie (or Trekker), but I'm guessing creator Gene Roddenberry's utopian vision of the future has undergone significant evolution since it was ushered in during the late 1960s? Similar to how Superman (for better or worse) no longer really stands for "Truth, Justice, and the American Way." So, a Black Box of sorts for one's soul? I dunno, I might instead opt for Juggernaut's fetching metal helmet (worn to protect him from mental attacks). And one can't help but think of a certain Death Star with a peculiar weakness. But couldn't you and I expire today in all sorts of accidental ways, without even a back-up downloading plan for our consciousness? I guess the thinking is that nothing's foolproof -- you do what you can and then roll the dice on the remaining risk. I'd like to leave on one major positive about AC, and it would be this: I'm always impressed by any comprehensive, detailed vision of the future. It's an impossible task to be able to predict how we'll be living in 25 years, let alone three centuries. The tech. The social mores. The lifestyles. 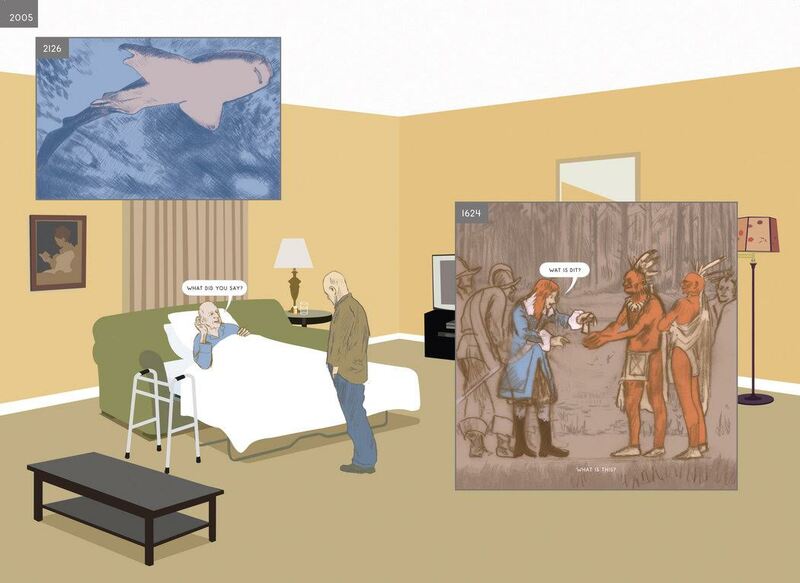 There's a recent graphic novel called Here, by Richard McGuire, which essentially shines a spotlight on one particular spot on the planet, and jumps back and forth through time to see what transpired on that spot. Long ago, there was nothing but vegetation. In the 1700s, there were settlers. Two centuries later came a series of nuclear families. And in the future... well, would that make you a bit nervous? I'd say that any vision of humans being around in 2384 (despite the violence) sounds pretty optimistic and benign indeed. Share March 9, 2018 • http://chrp.at/1pOg • Share on Facebook • Tweet This!